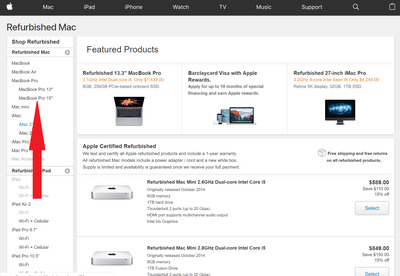 There’s a store on Apple’s website that’s hard to find, but it’s the best place to find Apple products for a discount. 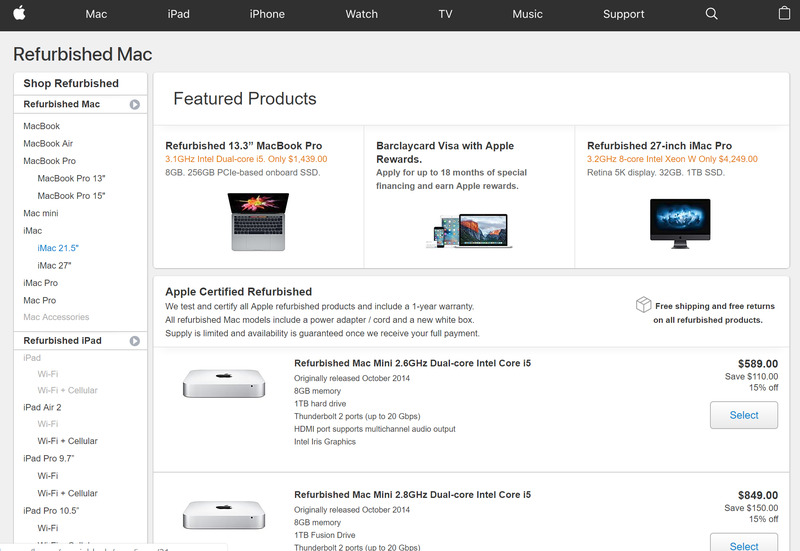 I’m talking about Apple’s Refurbished Mac store, where you can find a variety of used Apple products that have been refurbished by the company itself. You get a 15% discount, which doesn’t sound like a lot, but it’s still a few hundred dollars off the price tag of a brand new model – and that’s an extra few hundred dollars in your pocket that you wouldn’t have if you went with a brand-new unit. I’m aware that the word “refurbished” might put some people off, but if my fantastic experience with a refurbished 2016 15-inch MacBook Pro is anything to go by, there’s nothing to worry about. Apple’s refurbished laptops are especially smart to consider right now. Apple has started selling refurbished units of its 2018 lineup, which come with the most important update for Apple laptops in years: Intel’s latest 8th-generation of chips. Intel’s 8th-generation of chips is meaningful. So meaningful, in fact, that I’d dissuade most people from buying Mac laptops with older generations of Intel chips, especially in the 13-inch models, whether they’re brand new or refurbished. That’s because Intel’s 8th-generation of chips in Mac laptops contain four or more cores. For those who use Macs for regular work with more or less “basic” apps like Microsoft’s Office Suite, office messaging apps, and a web browser, it means better longevity for your Mac. 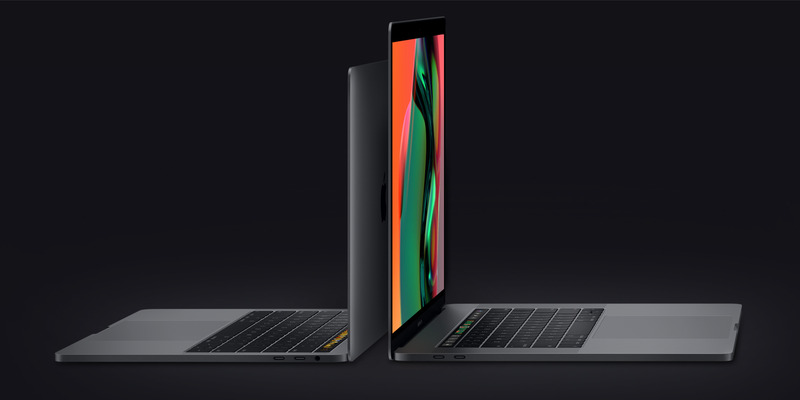 It will potentially give your MacBook longer legs by handling your workload for a longer time period than Mac laptops with older Intel chips that come with two cores. And for those using video and photo editing software, four cores or more mean faster and smoother editing. 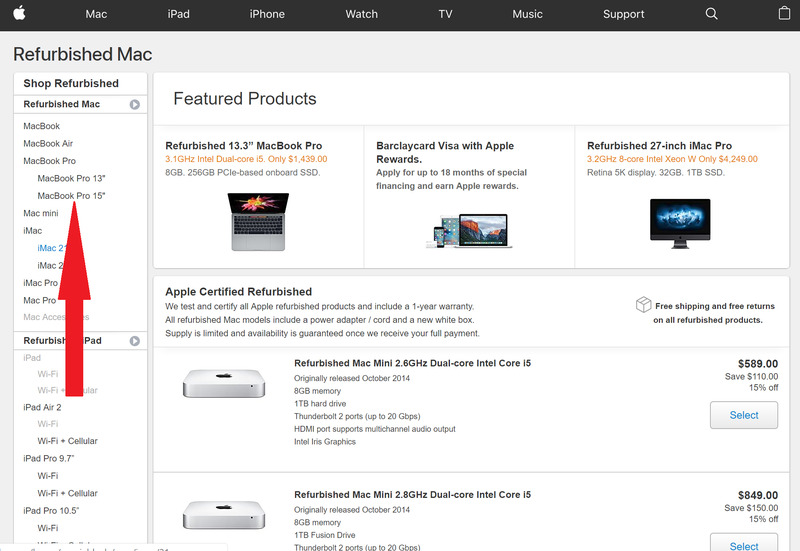 You’ll find Apple’s Refurbished Mac Store by clicking here. Then, click on the MacBook Pro with the screen size you’re looking for. 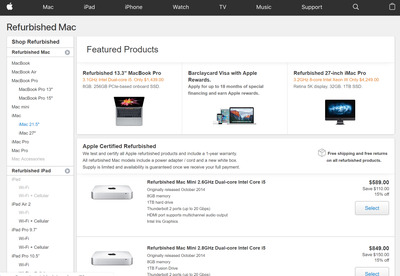 Apple offers refurbished models for both its 13-inch and 15-inch models. However, at the time of writing this article, only 13-inch 2018 refurbished models are still available. You can find the options towards the top left of the site, or click here to go directly to the 13-inch models, and here for the 15-inch models. 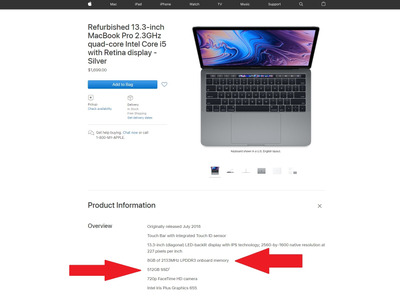 Apple’s 13-inch 2018 MacBook Pro uses Intel’s 8th-generation “Core i5” chip that comes with four cores. You can easily tell which laptops have that chip by looking for the word “quad-core” in the unit’s name. For example, you’ll see “Refurbished 13.3-inch MacBook Pro 2.3GHz quad-core Intel Core i5 with Retina display – Silver” when browsing through the store. Those units that don’t come with Intel’s 8th-generation of chips will say “dual-core.” You’ll also see the original release date as “2017.” You have to scroll all the way to the bottom to find the 2018 quad-core units. As of October 22, there aren’t any 2018 15-inch models available. But MacRumors spotted some earlier, which means Apple is stocking refurbished 2018 15-inch models, they have just already sold out. That’s just the nature of refurbished devices, especially popular ones from Apple. If you are interested in a 15-inch device, MacRumors uses a handy tool called Refurb Tracker that can alert you via email when refurbished 2018 15-inch models come back in stock. Even if you can’t find 2018 15-inch models with six cores, the 2017 15-inch models have four cores, which could be enough for your needs. If you’re looking at a 15-inch model mostly because you simply want a bigger screen rather than power, the 2017 quad-core models will suit you just fine – they should even have enough power for photo and video editing. 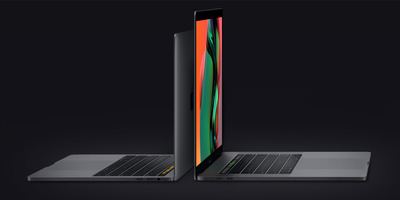 But if you want more power that comes with six cores, your best option is to either buy a new 2018 15-inch MacBook Pro, or hope that more people return their 2018 15-inch MacBook Pros to become available on the Apple Refurbished Mac store. There are two final things you should look at for either the 13-inch or 15-inch models. 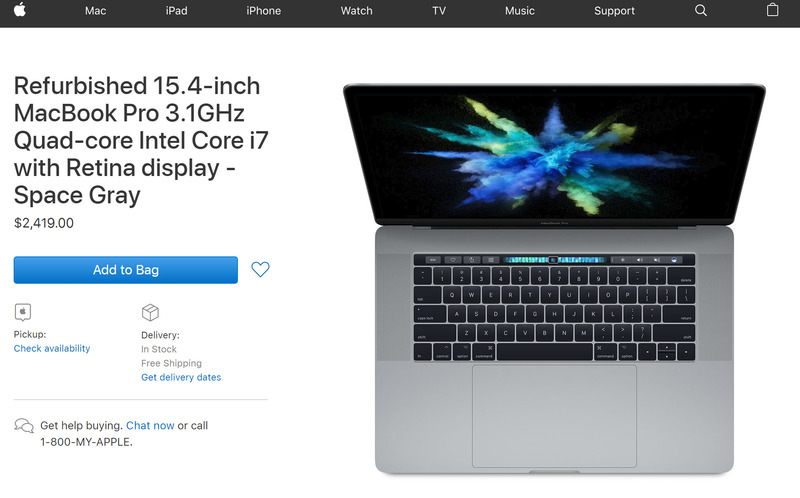 The default standard amount of RAM that comes with 13-inch MacBook Pros is 8GB, and that’s what you’re likely to find in the Apple Refurbished Mac store. If you want more RAM, you’ll either have to buy a new MacBook Pro and configure the specs up to 16GB of RAM, or hope that someone who bought a 2018 13-inch model with 16GB of RAM returns their laptop so it can refurbished and sold to you on Apple’s Refurbished Mac store. The 2018 15-inch models come standard with 16GB of RAM, which is fine for pretty much everyone. But if you want up to 32GB of RAM, your best bet is the same as above. For reference, 8GB is easily manageable, but 16GB is more “comfortable” for smooth performance in whatever you’re doing, even with lighter workloads where you’re primarily using a web browser. You’re also limited in your storage options, too, so make a point to see how much storage the refurbished units have. The prices of the refurbished MacBook Pro reflect the extra RAM or storage that each unit has. For example, a refurbished 2018 13-inch unit with the standard 256GB of storage goes for $US1,530, while a unit with 512GB goes for $US1,700. Those with more RAM than the default standard will also cost more, but you’re still getting a discount over the brand-new equivalent. Overall, you get a 15% discount with refurbished units over a brand-new MacBook Pro.